The first couple of days we just got settled in and recuperated a bit from our long trip and explored our area in Trastevere. There was a modern grocery store called Simply and we got the basics like tea and coffee, some fruit, milk a few veggies and chicken. We picked up Grilled chicken to eat that first night. It seems like this is becomming a ritual picking up what we call happy chicken on our first night in a new place. 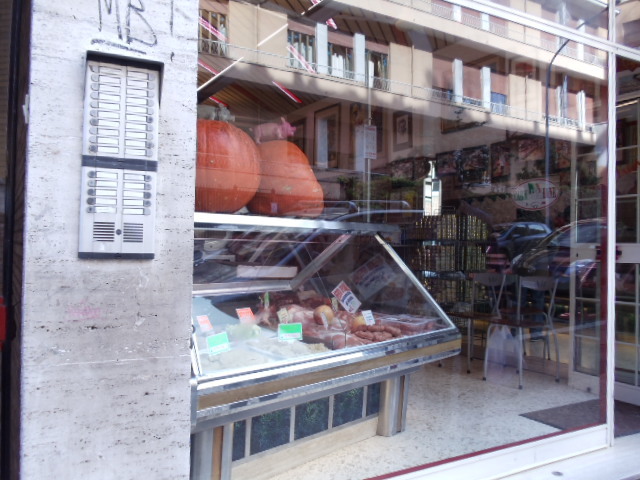 There were lots of nice food shops within a few blocks like bakeries, bread shops, small groceries with fresh produce, cheese, wine, and soft just made pasta, buffalo mozzarella and gelato. Everything we would need. 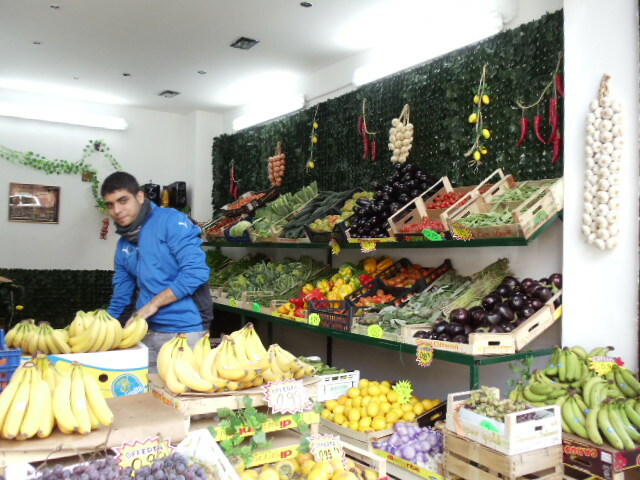 We would buy our food at these little shops while we were in Trastevere. 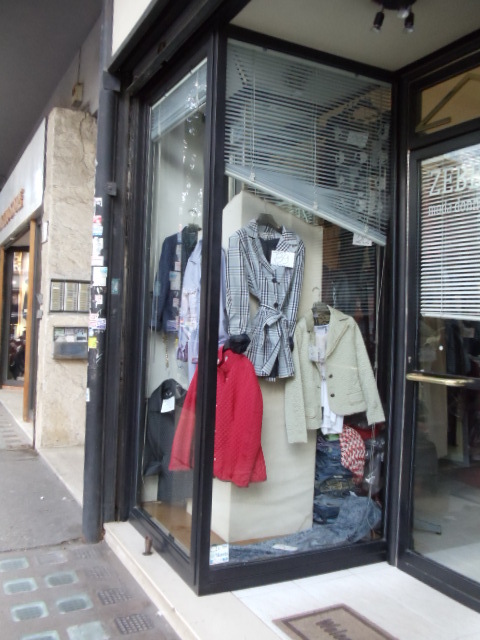 There were also lots of nice clothing stores, shoe stores, pharmacies…everything you would need right in our community. On the second night we took tram 8. 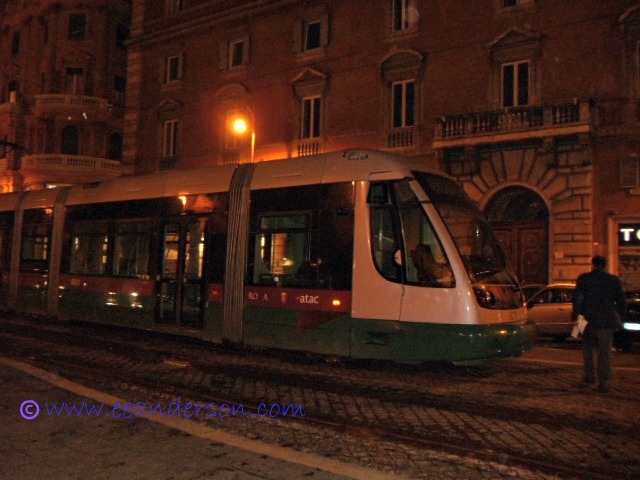 We planned on getting out at the Piazza Santa Maria but missed the stop and ended up at the end of the line at Largo Argentina. What good luck as we got to see our first ruins, the spot that Brutus and the other conspirators stabbed Julius Cesar. It was a lovely area and we strolled around and got our first gelato before heading back. When we got back to the tram, it was stopped and empty and every one was standing around. People were confronting the driver and he was throwing his arms in the air gesturing , from what I could deduce, was that it wasn’t his fault or what could he do. We decided it must be broken down. He moved over to a little grass area and I followed him and asked if there was another tram coming. He said a replacement bus to take us back would arrive in a few minutes. True to his word a bus came and picked us up. 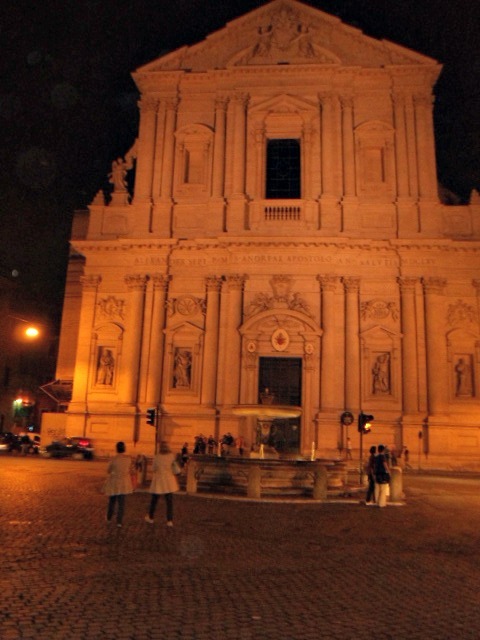 This was also good luck for us as it took us on a kind of free night-light tour of Rome on the way home. We saw lots of buildings lit up in all their grandeur. 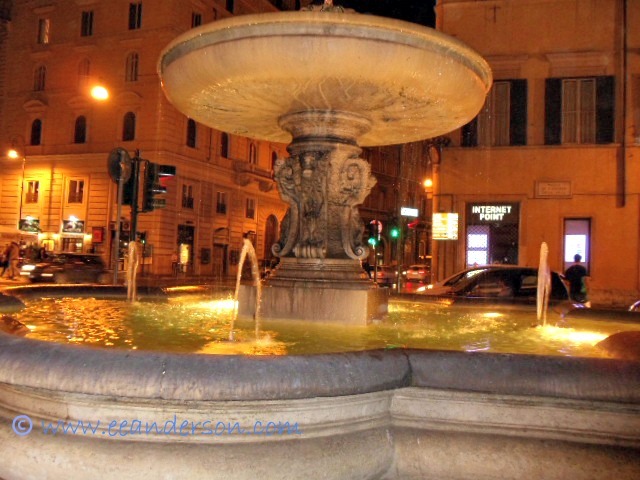 It dropped us off right at the corner by the Trastevere station. Since inconveniences seemed to turn to good fortune I was certain that Rome would be a lucky place for us. 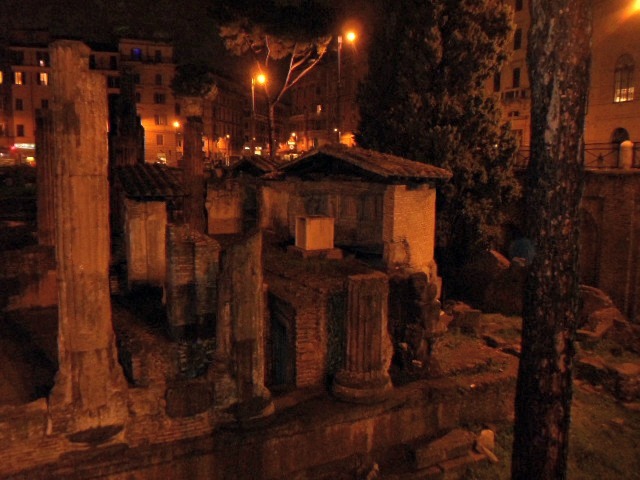 This entry was posted in Food, Italy, Rome, Travel and tagged Italy, Largo Argentina, Rome, ruins, Trastevere. Bookmark the permalink. That sounds like an exciting trip and starting off with lucky chicken. I wouldn’t mind some gelato either. Yes, it was an amazing trip. I love Italy and gelato…I could go for some right now. It is really funny but there always seems to be an outdoor grill or rositer of chicken across the street or nearby when we travel. This started in Mexico at Pollo Feliz many years ago.